Land Information New Zealand (http://www.linz.govt.nz/) is a phenomenally good source of free mapping data for New Zealand. Data for geographic features, roads and ground cover is kept current. Using the 1:50,000 topographic information we can create very good base maps as a starting point for outdoor recreational use. 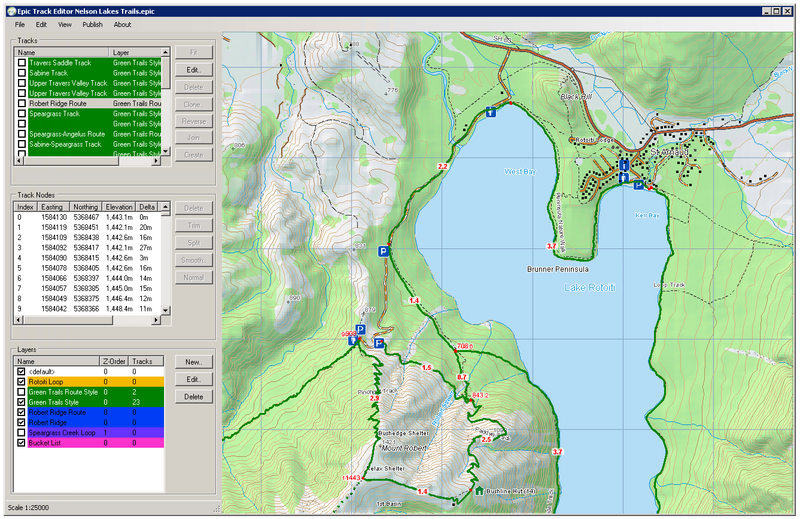 Add to that current information about huts from DOC (http://www.doc.govt.nz/) and accurate hi-res GPS track logs for trails and we start to see the potential for really good results for trail running maps. Street maps (Google, etc.) are useless for outdoor recreation because they are designed with driving directions in mind. They typically do not include topographic features and landmarks that are required for back country navigation. Satellite views while they appear detailed are not terribly useful for traditional outdoor navigation (even in 3D ala Google Earth). 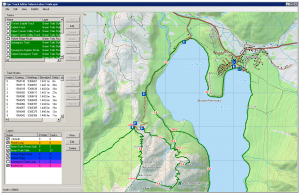 Most 3rd party topographic map applications targeted at New Zealand outdoor recreation have simply “refried” the bitmap images from LINZ 1:50,000 maps. This means zooming in just shows grainy version of the same image and it also does not lend itself to editing and updating (replacing LINZ tracks with more accurate recently captured actual tracks). We decided to build a map renderer that gives us the best of all worlds: LINZ data for the geographic, road and land cover information supplemented with our own trail data. We render these maps using the same styles and symbols as traditional LINZ TOPO 50 maps to make them appear familiar to Kiwi users. Our renderer is vector-based which means we can render maps at scales up to 1:10,000 without loss of quality. On the editing front, we have powerful features for editing we can do detailed editing of tracks and track segments, use styles specific to trail mapping, use custom layers for grouping and applying styles and add custom point entities like icons for huts, parking, info and toilets. Features continue to evolve as we come up with new requirements. 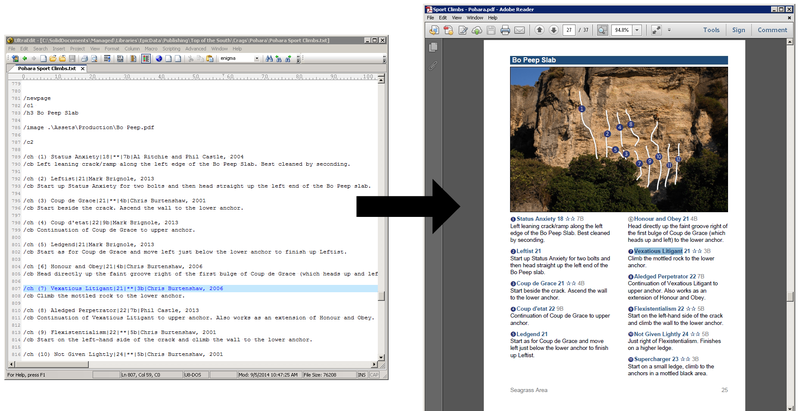 Our first attempt at editing a sport climbing guidebook involved the usual suspects (InDesign and Illustrator). We quickly grew weary of using our computers like old school type writers and this lead to development of our own climbing guidebook generation software. For now we have a simple markup language that is easily editable in a plain text editor (no nested < and > characters as one would have in formats like HTML and XML, no need for escaping common characters with &). From this markup language we can build a model in memory which “understands” concepts unique to climbing guidebooks like grade, first ascent, number of bolts, etc. From this model we render the guide book automatically in multiple possible formats including PDF for download, PDF for print and e-book format (Kindle). One of the most annoying things to update in climbing guidebooks when using a generic editor (like InDesign) is all the different climbing-specific indices. Most editors can handle a traditional indices like table of contents and perhaps and alphabetic index of climbs at the back of the book. In addition to the name of the climb, our tool understands how to use grade, first ascent and sector to help with indexing. This gives us an index of climbs sorted by grade, sector and then name. It gives us summary tables at the start of each section showing the number of climbs per grade bracket. It allows us to show first ascent names and dates in an index rather than inline in the content. For cross references, all page numbers are automatically updated as one would expect. Page numbers are replaced by hyper-links for the e-book version. Minor adjustments to styles are automatically propagated. What’s the benefit? Updates. Inserting new climbs or entire new sectors results in automatic updating and regeneration of the entire book. Our primary objective is to keep our guides current and not fall years behind over time as the traditional books do. We’re prepared to live with weaker layout and some cosmetic issues in the initial stages in exchange for always being accurate and current.